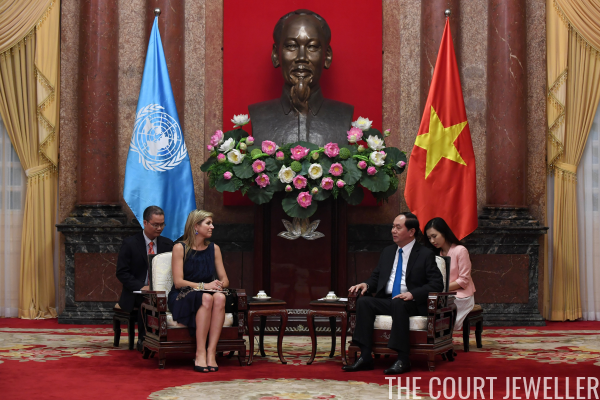 Queen Maxima of the Netherlands is on a three-day visit to Vietnam this week as a part of her role as the United Nations' Secretary General's Special Advocate for Financial Inclusion. Here's a look at some of the accessories she brought along on the trip. 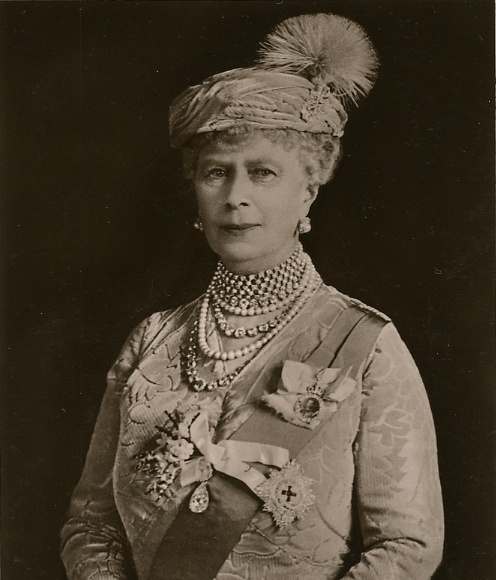 Yesterday, the official trailer for a new film, Victoria and Abdul, about the later years of Queen Victoria's life, debuted online. 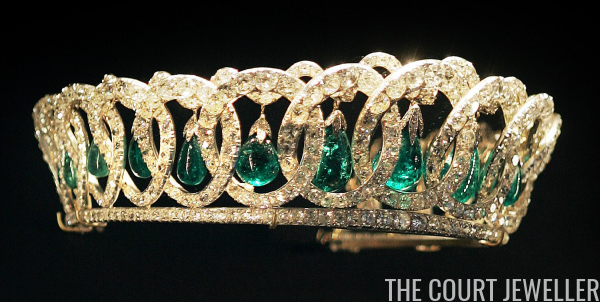 You know what that means: time for another installment of Jewels on Film! Each of the images provided here should be able to be easily enlarged for a better view of the details -- just click on the picture. 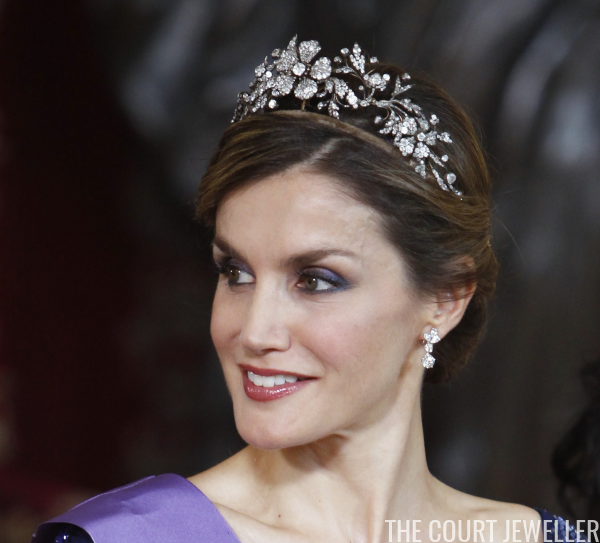 Time for another survey of some of the earrings that Queen Letizia of Spain has been wearing recently! We've got quite the range here, from affordable pieces to precious gems, in a week's worth of jewelry. 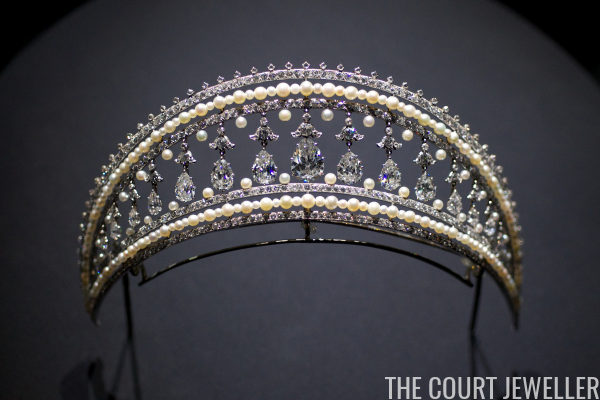 There are royal jewels, and then there are royal jewels from the collection of Mary of Teck. 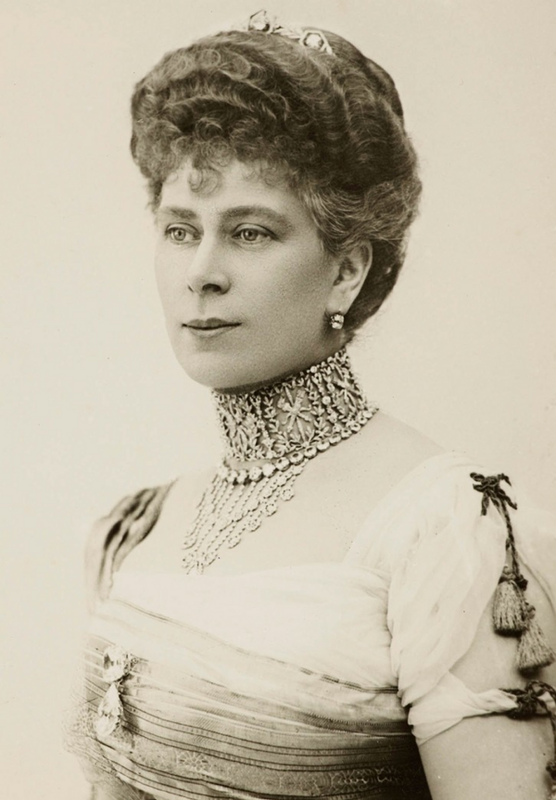 Queen Mary had a keen eye for brilliance when it came to augmenting and culling her jewelry collection, and the British royal vaults today are stocked with excellent pieces that came straight from her jewelry box. Here are ten of my favorite pieces from her collection. Be sure to share your own top ten list in the comments below! 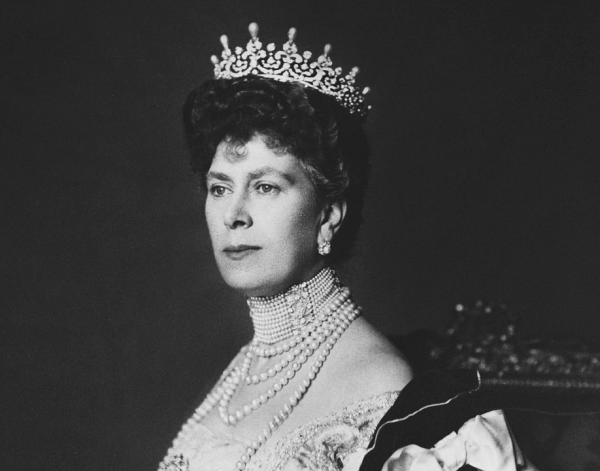 Our celebrations of the 150th birthday of Mary of Teck continue today with a post that was really fun to put together -- a group of GIFs that show some of Mary's engagements, both daytime and evening, in motion. Enjoy! 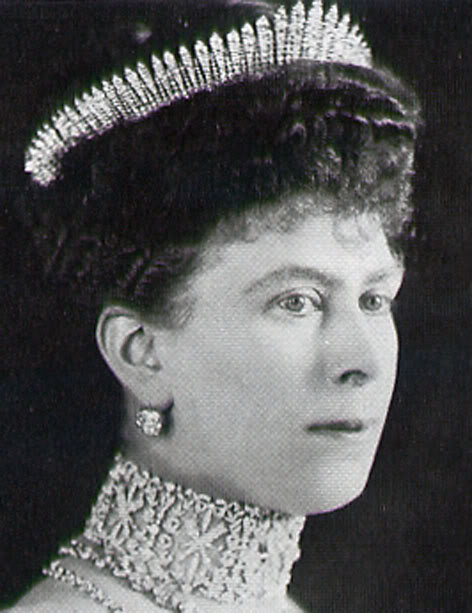 Our celebration of the 150th anniversary of Queen Mary's birth continues today with a sparkler that marked the beginning of her tenure as a senior British royal: her wedding tiara. 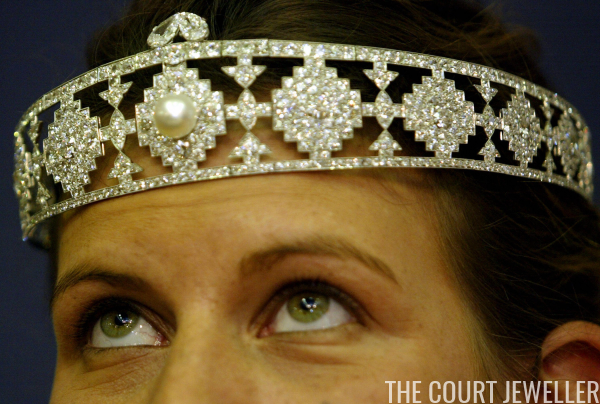 The Vladimir Tiara (with the Cambridge emerald drops) is displayed in profile view at Buckingham Palace, July 2006. 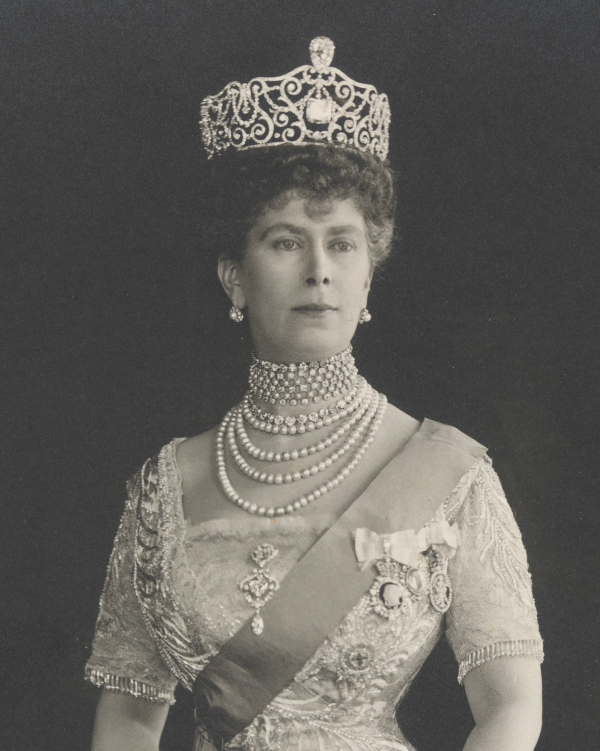 The tiara was purchased from the family of the late Grand Duchess Vladimir by Queen Mary; today is the 150th anniversary of Queen Mary's birth, and this post kicks off a long weekend of celebrations of her jewels here at The Court Jeweller. 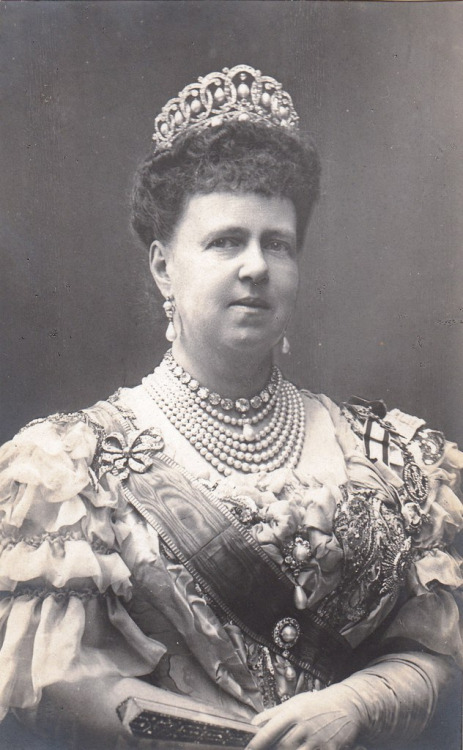 Stay tuned for posts on the Grand Magpie's jewels on Saturday, Sunday, and Monday! 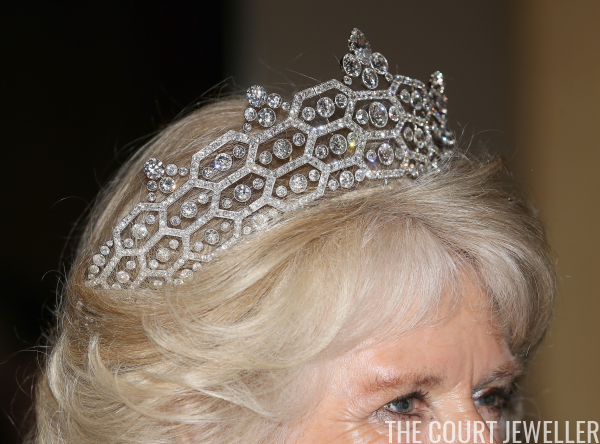 There were lots of royal jewels to choose from this week, including a couple of sparkly tiara events! Don't forget to vote for your favorites in the poll below. 10. 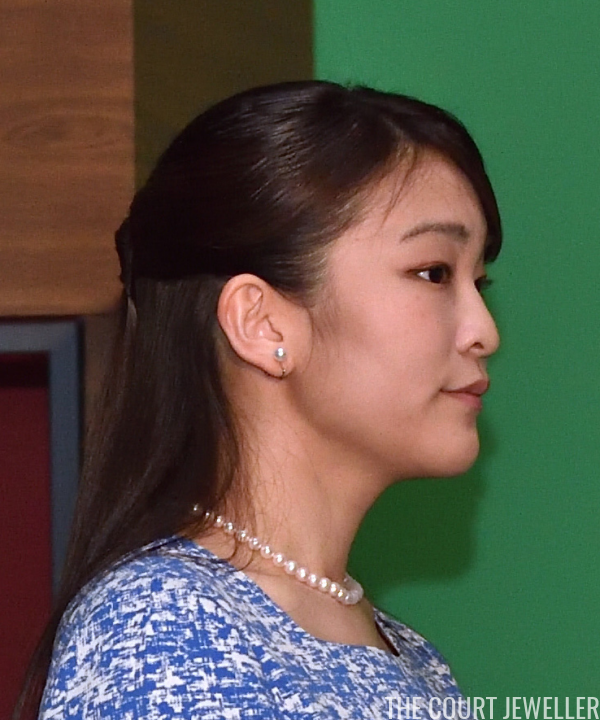 Princess Mako of Akishino, who has gained press attention recently because of her engagement, wore pearls to visit a natural history exhibition in Tokyo on Monday. 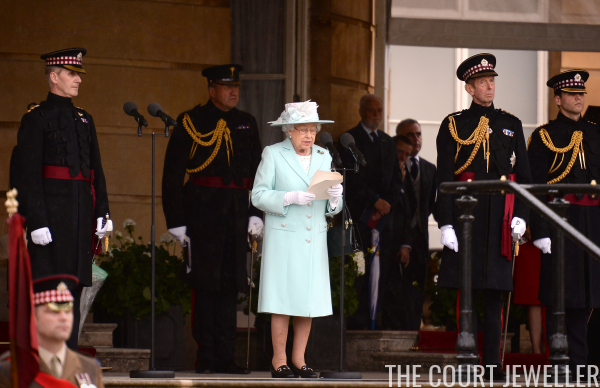 Queen Elizabeth II of the United Kingdom has been busy this week. After her appearance at the Chelsea Flower Show on Monday, she's had three more major engagements. 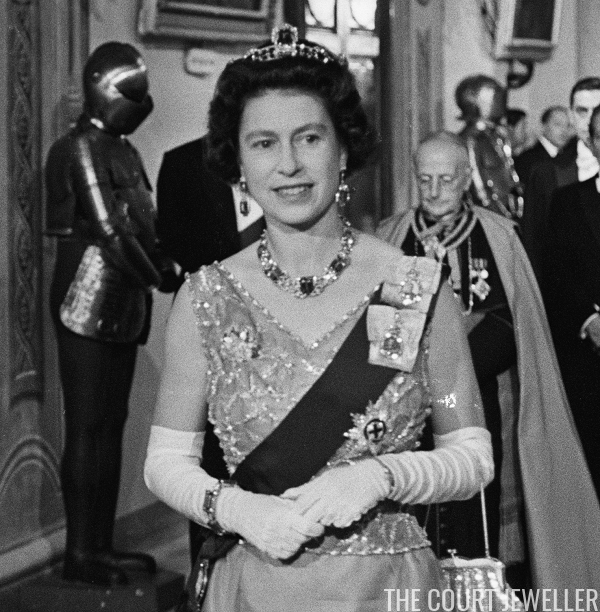 Here's a look at the brooches she chose for those occasions. 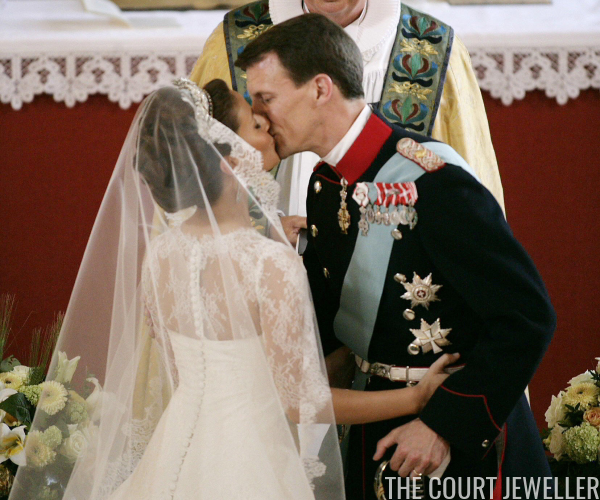 Time for part two of our coverage of the jewels worn at Prince Joachim and Princess Marie of Denmark's wedding, which took place nine years ago today in Mogeltonder. 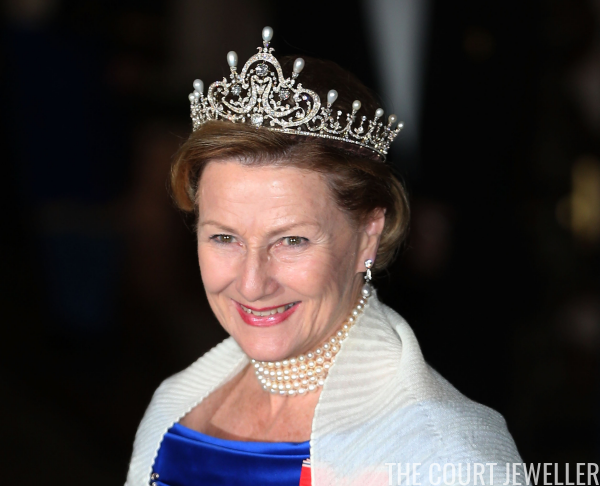 This post features the jewels worn by the families of Princess Benedikte and Queen Anne-Marie; head over here for more jewels from the Danish, Swedish, and Norwegian royals! 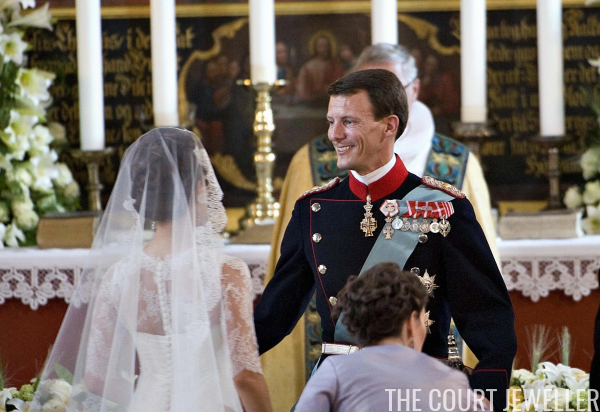 Nine years ago today, Prince Joachim of Denmark married Marie Cavallier in Mogeltonder. 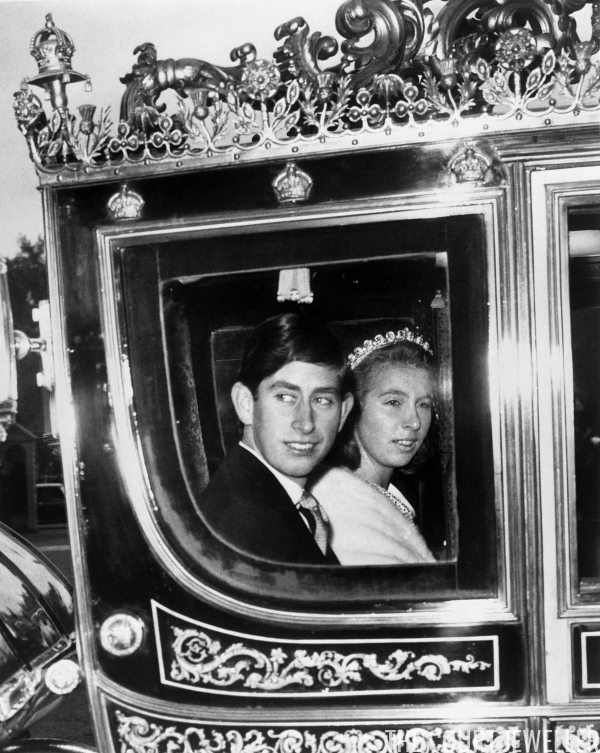 Today, we've got two flashback posts on tap full of jewels from this royal wedding. 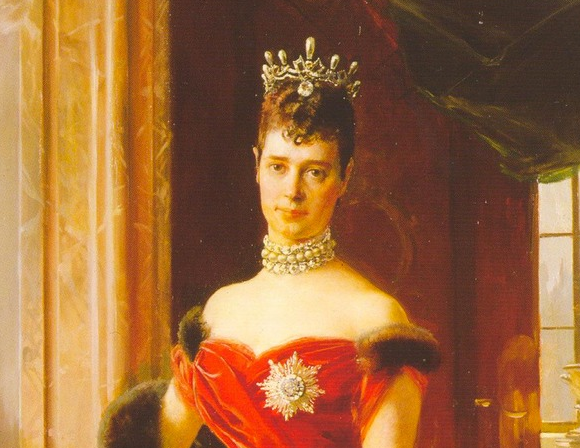 Enjoy this look at jewels worn by the main line of the Danish royal family, plus the Norwegian and Swedish royals, and stop back for even more royal jewels later today! 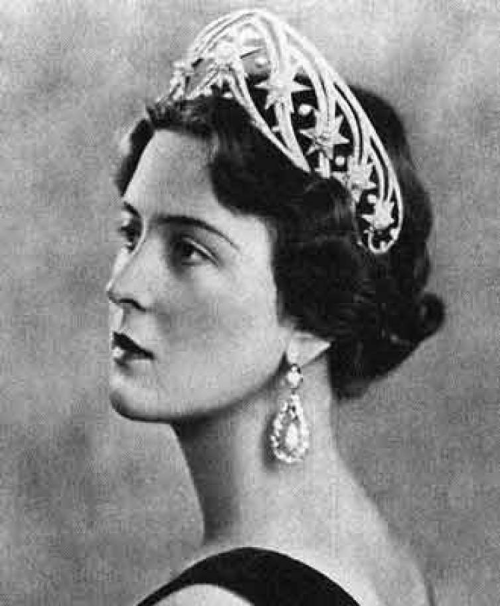 Several readers have contacted me recently with information about the diamond fringe earrings worn by Crown Princess Mary of Denmark at the recent birthday celebrations in Norway. Turns out Mary's been shopping the auction catalogues again! Princess Beatrice of York and her mother, Sarah, Duchess of York, attended the Fashion for Relief event in Cannes on Sunday, and both of them wore intriguing statement jewels. 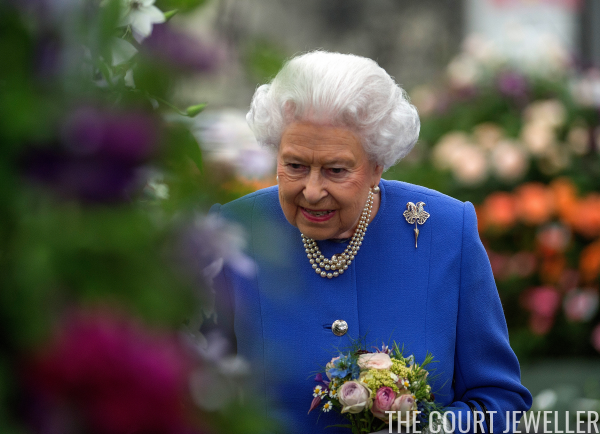 The British royal family made its annual visit to the RHS Chelsea Flower Show this afternoon, and they brought some garden-themed jewelry along with them. Today, King Felipe VI and Queen Letizia of Spain celebrate their thirteenth wedding anniversary. 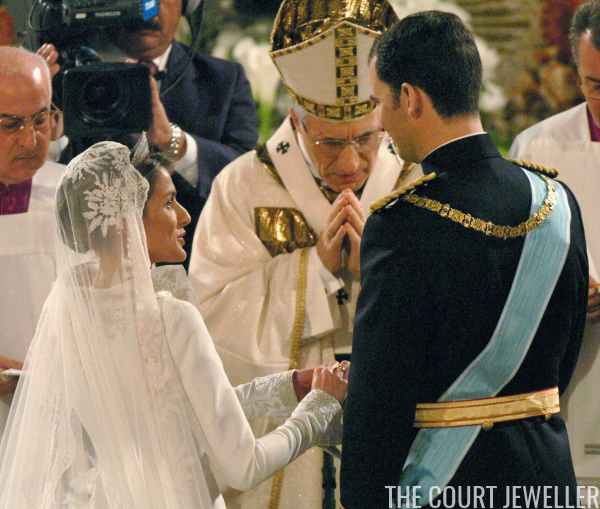 In honor of their big day, here's a look back at the jewels worn by Letizia at her wedding. This month has been packed with royal celebrations in Norway, including birthday festivities for King Harald V and Queen Sonja and last week's annual Constitution Day. 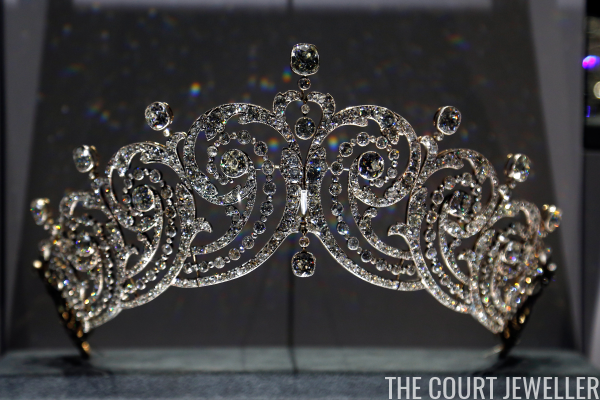 I thought it was only appropriate that we continue the celebrations with a look at some of her jewels in motion! 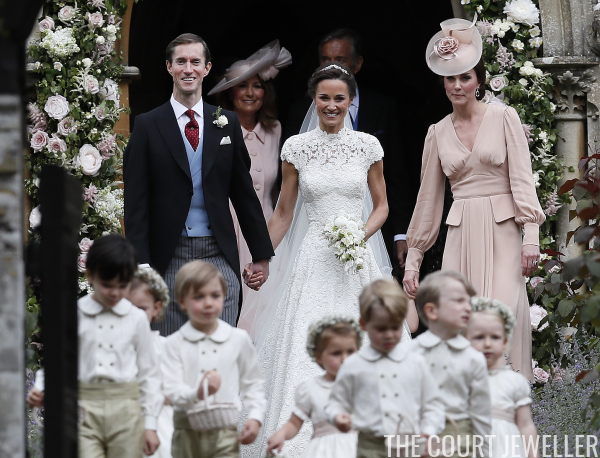 The long-awaited nuptials of Pippa Middleton, sister of the Duchess of Cambridge, took place today in Berkshire. 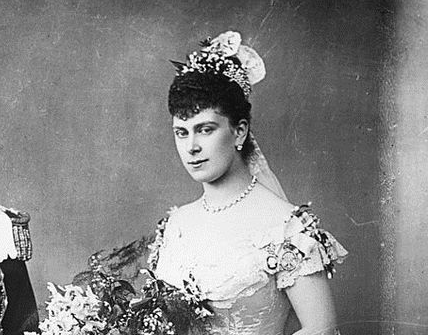 Pippa married James Matthews at St. Mark's Church in Englefield, and there were both bridal and royal jewels on display. 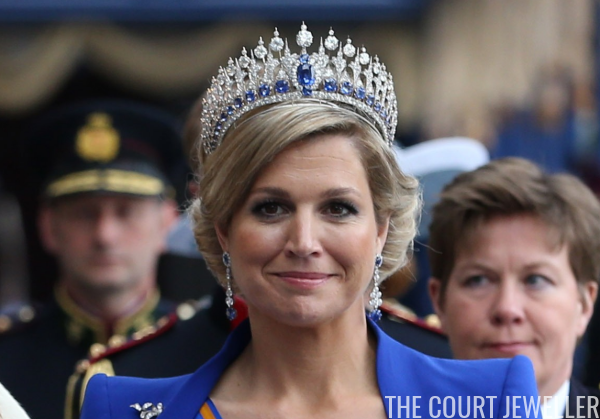 This week, Queen Maxima of the Netherlands celebrated her 46th birthday. 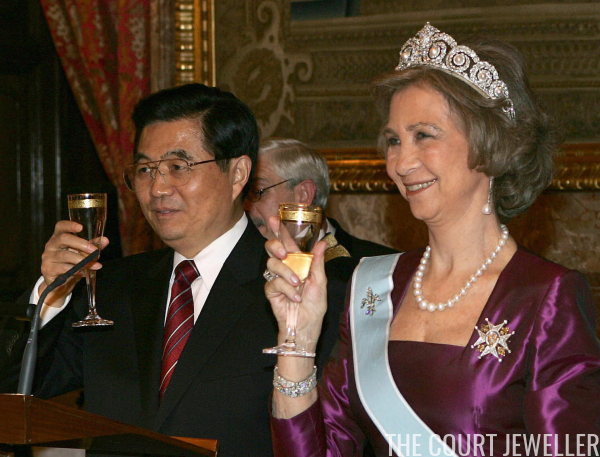 To mark the anniversary, we're spending today with a sparkler that is becoming increasingly associated with her: the Dutch Sapphire Parure Tiara. 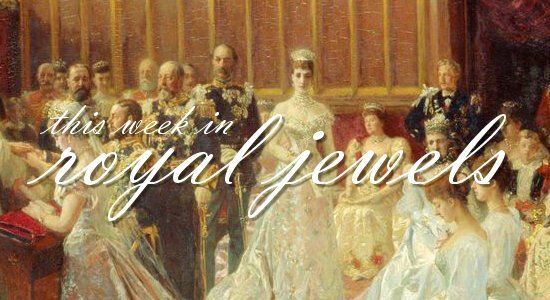 Spring is in full swing in the world of royalty, and our jewels this week strongly reflect the season. Be sure to vote for your favorites in the poll below! 10. The Duchess of Cambridge wore her Annoushka pearl drops with her Kiki McDonough diamond hoops for a tea party on Saturday at Buckingham Palace, held for the children of those who have died serving in the armed forces. 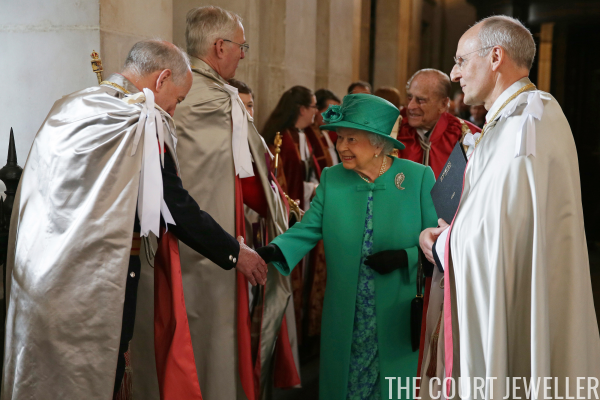 Queen Elizabeth II of the United Kingdom joined the Duke of Kent this morning at Buckingham Palace to present new colours to the 1st Battalion and and F Company Scots Guards -- and it appears that she may have brought a new brooch along with her! This afternoon, Queen Maxima of the Netherlands visited the Princess Maxima Center for Pediatric Oncology in Utrecht. 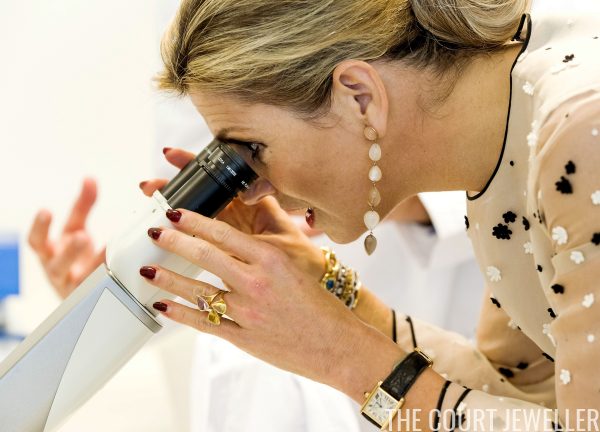 Her tour of one of the facility's laboratories gave us some fascinating views of her jewelry. Hereditary Grand Duke Guillaume and Hereditary Grand Duchess Stephanie of Luxembourg joined the glamorous celebrities at the Cannes Film Festival on Wednesday, and Stephanie's glittering jewels lived up to even the most sparkling of movie star gems. 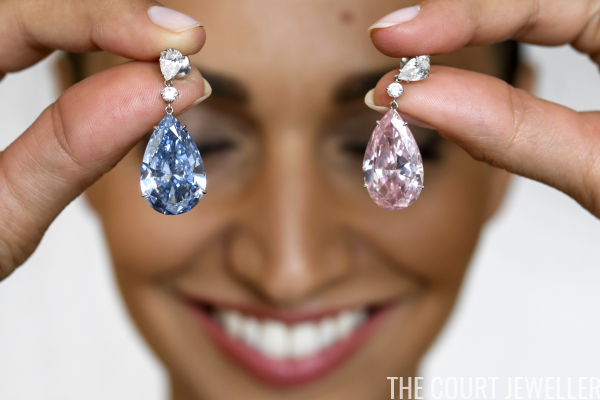 Earlier this week, I featured a pair of remarkable earrings, the Apollo Blue and the Artemis Pink, that were part of Tuesday's Magnificent Jewels sale at Sotheby's in Geneva. The earrings sold, and the price they fetched was nothing short of staggering. 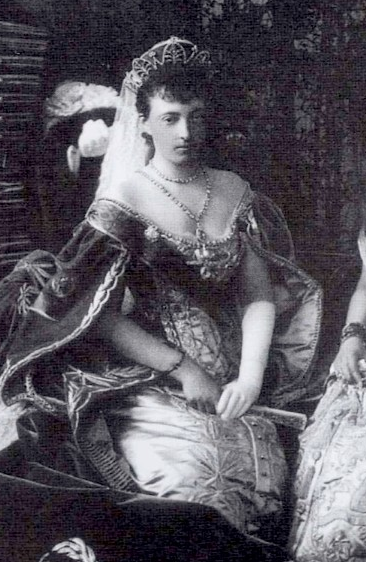 Japanese media reports indicate that an engagement announcement is expected soon from the imperial palace. 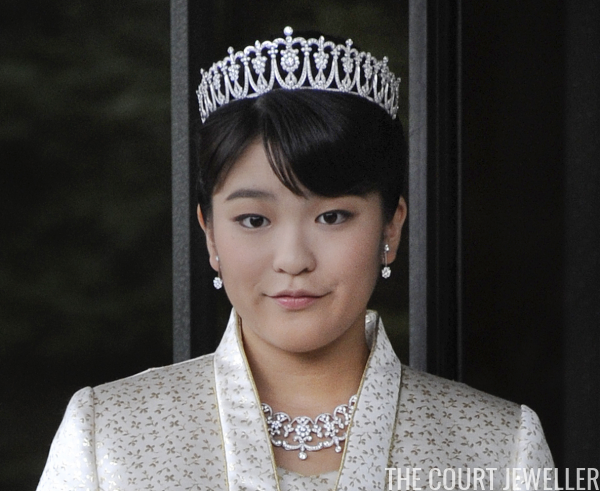 Princess Mako of Akishino, the eldest granddaughter of the Emperor and Empress, is reportedly engaged to Kei Komuro. 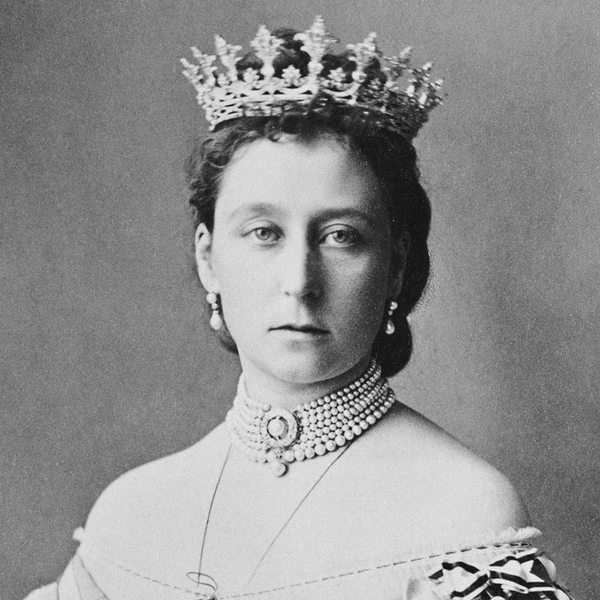 But while royal engagements usually start conversations about jewel appearances to come, this announcement would mean that royal jewels will be left behind. 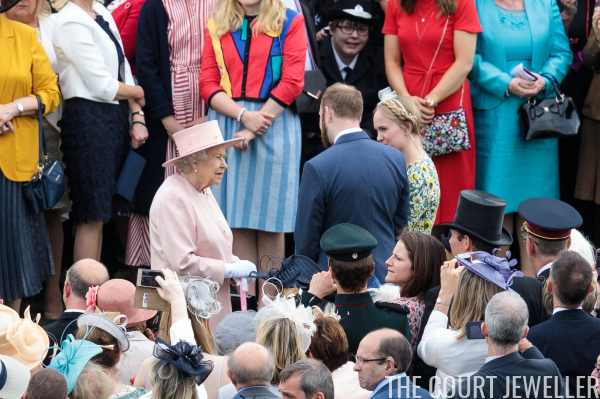 The Windsors held their first garden party of the season at Buckingham Palace this afternoon, and five royal ladies were among the gathered crowds. 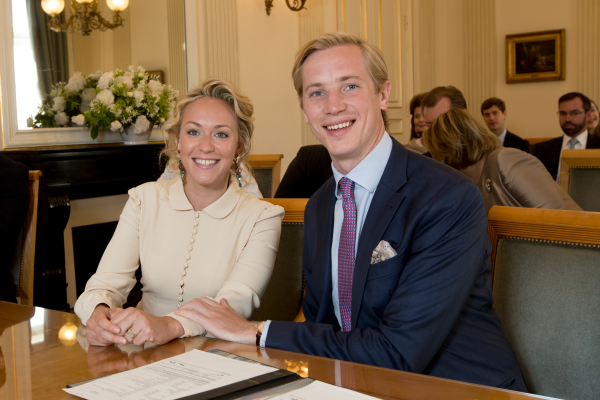 Yesterday in Luxembourg, a civil royal wedding ceremony brought out some grand ducal bling! 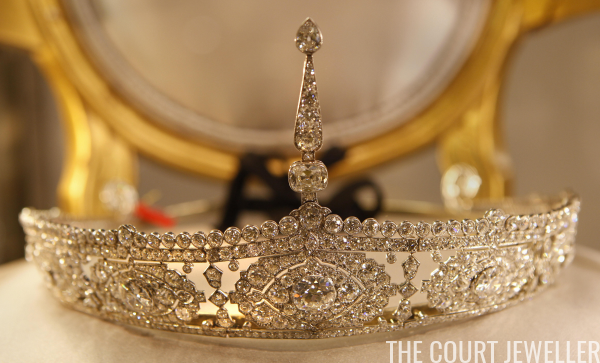 Here are some of the jewels we saw as Princess Marie-Gabrielle of Nassau married Antonius Willms. 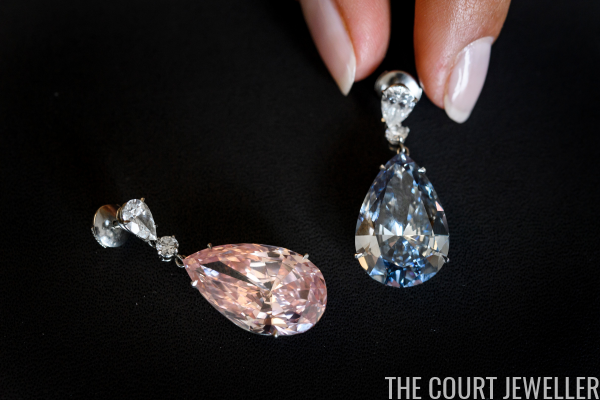 Sotheby's is having another of its blockbuster Magnificent Jewels sales this week in Geneva, and a rather remarkable pair of diamond earrings are up for auction. Dubbed "the Artemis Pink" and "the Apollo Blue," the earrings can be worn as a mismatched pair -- but they will be sold individually, and they're expected to fetch a small fortune. 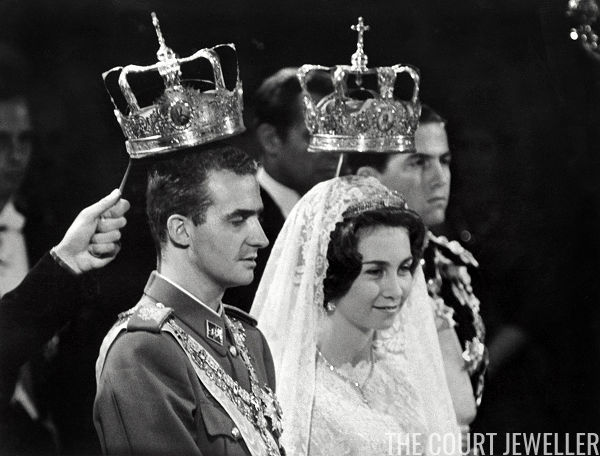 Fifty-five years ago today, Don Juan Carlos of Spain married Princess Sophia of Greece and Denmark in Athens. 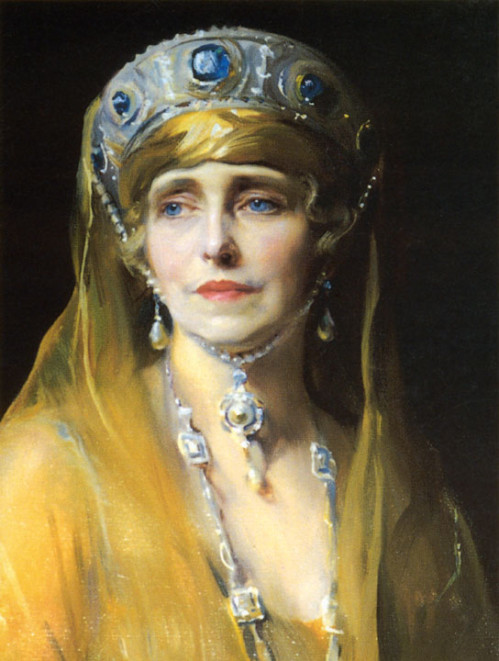 The Greek princess (who changed the spelling of her name to the Spanish Sofia) wore a family heirloom, the Prussian Tiara, to wed the future Spanish king in two ceremonies (one Roman Catholic, one Greek Orthodox). Here's a look at snippets from their wedding day! 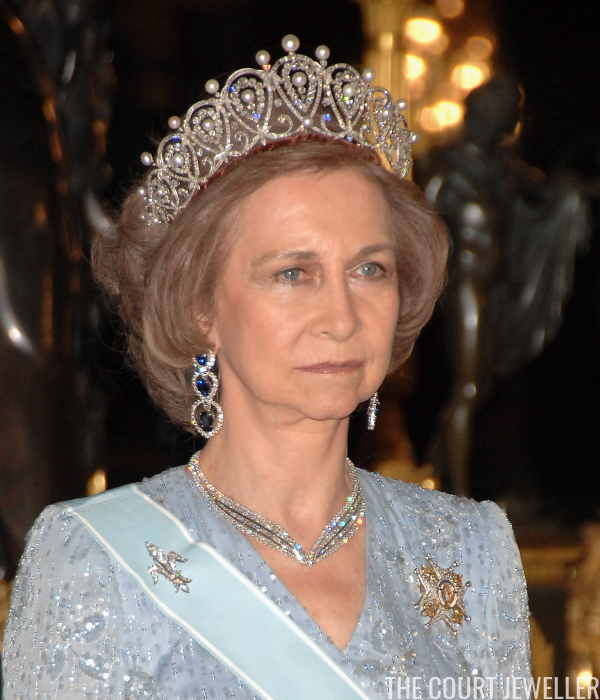 After the abdication of King Juan Carlos of Spain, some of the jewels worn Queen Sofia, his wife, were automatically passed along to the country's new queen consort, Queen Letizia. 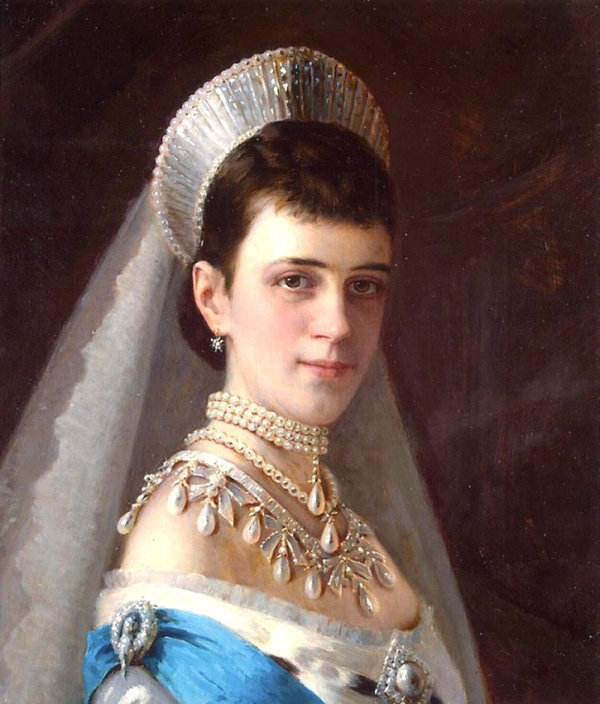 But most of the tiaras worn by Sofia are her personal property, including today's sparkler, her diamond floral tiara.